Everything bad about a woman has probably been spoken for and against models everywhere in the world. Malawi and Blantyre is not an exception. However, Miss Blantyre 2015 themed ‘beyond beauty’ is a tale too different to tell for the shuttered standards of modeling. Here is a country where all models look up to grow from their community crowns to become Miss Malawi and represent the nation at global level. Maybe we will get there. Against all odds, Miss Blantyre 2015 is all set for Friday 6th November 2015 at The College of Medicine Sports Complex Hall. The event is red carpet and starts at 6PM. “Delegates should come in their large numbers, bring their friends, family and loved ones to this glamorous event and peaceful entertainment. At exactly 6pm, a photoshoot will have started where fans will enjoy a Free photo session from various professional photographers that have been hired by the organisers” Said Daniel Ngwira, Chairperson of the organising team. Apart from the ladies competing, there will also be another splendor of performances from musicians, poets, dancers and stand up comedians. Notably, musicians Nesnes, Mwanache, Blakjak, Mafo, Lady Pace, Black Nina and Blakjak. The Miss Blantyre Night this Friday is definitely another ‘Signal’ that is ‘Busy’. From the build up and billing of this show, its one of those must-go events. “Being fashion crazy, this is one sort of event where ladies dress to express and impress and definitely men will not lower the game either” said Faith Meekness Ng’ong’ola, lead fashion designer for Stylish designs, one of the official designers for Miss Blantyre 2015. Companies have quite been excited with the brand exhibition category where models will parade for brands. On sponsorship, Miss Blantyre 2015 has mainly been supported by Yanga.co from Lilongwe who are giving out grand prize of Ambassadorship for online education in Malawi that will come with a motor vehicle benefit. Blantyre City Council awards the winner as an ambassador for The Keep Blantyre Clean and Green Campaign, BizMalawi, a lead partner has fueled the event from its build up and has been a leader in telemarketing, AXA Bus Limited has given out 5 return tickets to Lilongwe, Khaiko and Bluegum Lodges of Likoma have offered holiday nights, Ryalls hotel offered two nights, Techno Brain has offered scholarships to three top ladies, Julies Cakes offering a baking course to winner, C and I Events helped with event management, Beta and Matindi TVs will cover event. Hallmark Creations and Krazy Foods of Blantyre have also been supportive to this event. Mayor of Blantyre City will be Guest of honor at the event. There is huge expectation that most Blantyre based business gurus, celebrities and companies will be there. Daggers drawn! Who will be the next Miss Blantrye? Chisomo Machelo, Vanessa Chiutsi, Mercy Mtileni, Atupele Chikalimba, Juditta Hammond, Victoria Mhone, Loveness Chivambe, Murimu Kachitsa, Sandra Kalua, Tunochele Mwakalenga, Lucy Banda and Vanessa Thyolani. 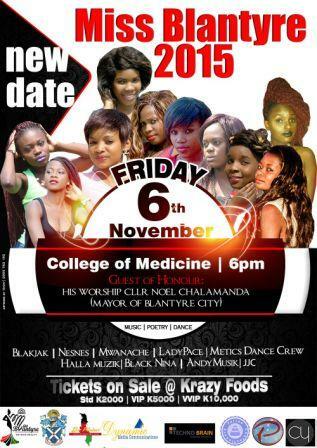 This is a big question for Blantyre City come Friday night 6th November 2015. Outgoing Miss Blantyre is Nerani Nthara, a 3rd year student at The Polytechnic. Her Princesses were Yalenga Vinkhumbo and Samantha Williams respectively. The last Miss Blantyre happened on 6th December 2013. Going by the theme ‘beyond beauty’ organisers pioneer for a beauty queen who has extracurricular skills that will best speak for the people of Blantyre and stand out in most issues of importance to the community. According to the event Chairperson, Daniel Ngwira, Blantyre City Council has been a thorn in the flesh of this pageant’s success. “Beauty is nothing without a clean environment and with the city council’s Keep Blantyre Clean and Green ambassadorship, our Miss Blantyre will be so relevant to her community” said Ngwira. As an IT company with focus in online education, they deemed it right to award the winner as the face of their brand for her tenure of office and let her manage their Blantyre operations with fair benefits. Being a queen, a motor vehicle will ease and add value to her mobility and social status” Said Managing Director for Yanga. Co Mr. Earnest Kapeleta. She will assume the Blantyre offices in January 2016. Two things are clear here; if you have a friend, boyfriend, girlfriend, husband, wife, buddy and they don’t take you to Miss Blantyre this Friday night, they aint loyal and its possible they are cheating on you! See you there. Miss Blantyre tickets are selling Krazy Foods restaurant in Blantyre and will also be available at the door.